After twenty successful years of operating in Soho, Nusa Dua decided to pack up and relocate all the way to… the end of the road. 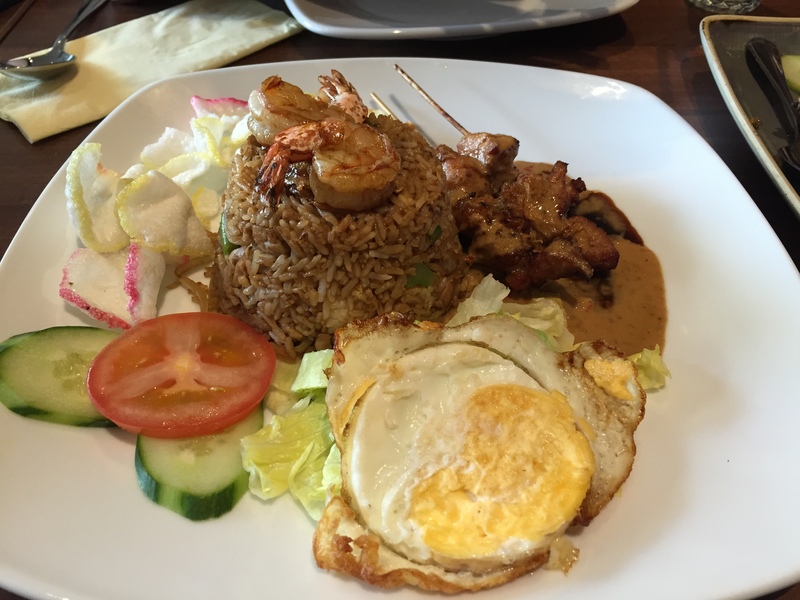 Having recently reopened in a well decorated unit on the corner of China Town, opposite the Curzon Soho cinema, A and I were invited to try out Nusa Dua’s authentic Indonesian food. After downing some prawn crackers, a beautifully presented entrée swiftly arrived at our table, which consisted of: two chicken saté skewers; four chicken wings; and two spring rolls. The chicken saté tasted delicious on its own, but together with the peanut and sweet soy sauce it was impeccable. Cooked with a charred texture, the chicken was very soft inside and was full of flavour. The sweet soy sauce and the saltier peanut flavour combined well to start the meal off on a positive note. 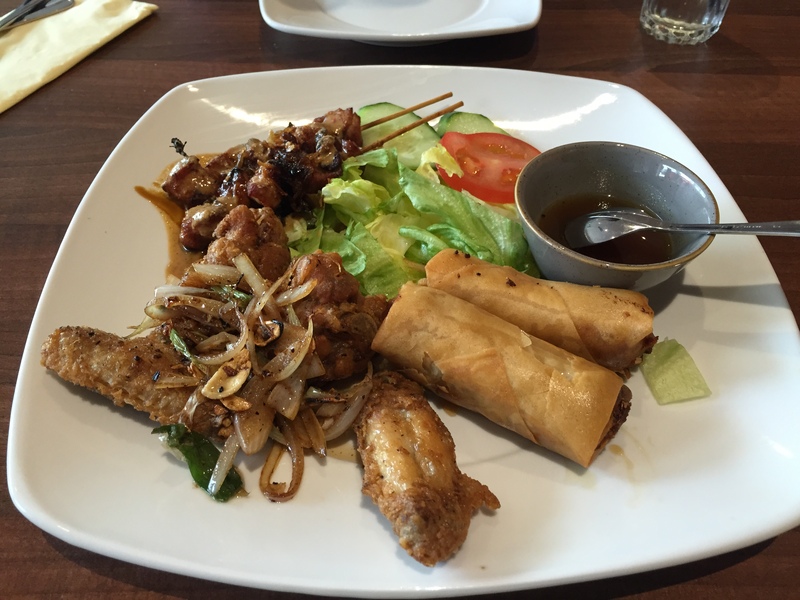 We really enjoyed this starter and it was definitely better than other places where we have tried it such as Penang! I was looking forward to the Indonesian touch that Nusa Dua would add to the chicken wings, and both A and I unanimously agreed that it was a welcome one. The wings were crisp and saltier than ones you’d find at KFC, or your local chicken shop, but they tasted great. The batter was a bit greasy though, but this time not as much as your local Dixy! A is still raving about these spring rolls, which I wasn’t quite as mesmerised by. The spring rolls were authentic and different from those I’ve eaten before. Served with a ginger and sweet sugar sauce, the spring rolls were filled with chicken, fried egg, and bamboo shoots; an interesting combination that I would definitely recommend you try. You know those chillies used in menus that signify how spicy dishes are? At Nusa Dua do NOT underestimate them. When A and I saw the three chillies alongside Kambing Cabe Ijo in the menu, we smirked. 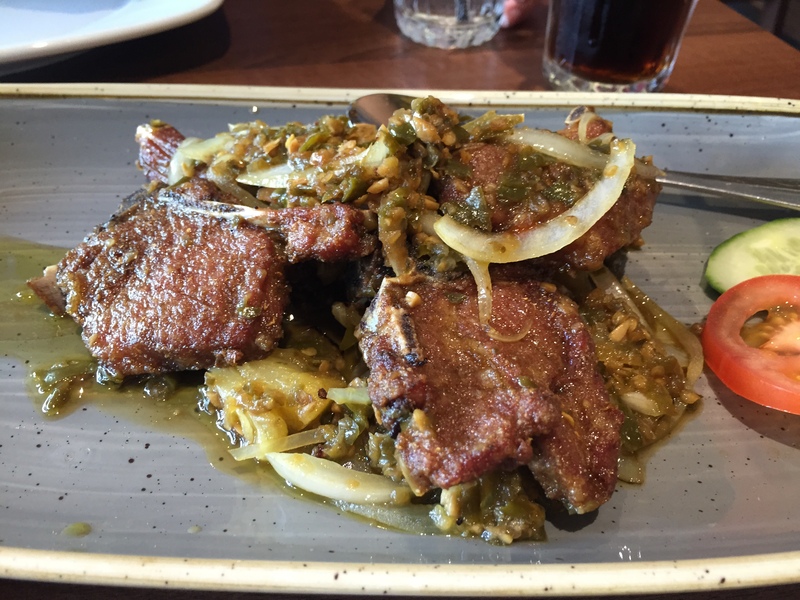 That smirk was replaced with struggle when we each took a bite of these lamb chops, because they were seriously spicy. The pineapples that were served with the lamb chops didn’t add a noticeable amount of contrast to the flavour, unfortunately. I would recommend you try them for the challenge, but if you can’t handle spice, stay away! The presentation of this dish wasn’t great and compared to the shared platter it didn’t look appetising. The fried rice and prawns tasted nice but we felt that the shredded chicken wasn’t completely fresh and felt slightly rubbery. Fortunately for A and I, the Nasi Goreng Komplit came with another two skewers of chicken saté for us to gobble up. It was clear why Nusa Dua have been going for so long, and I’m sure they will continue to do so for even longer. Both A and I enjoyed our visit, but apart from the delicious (and good value) shared platter we feel that the items we were recommended weren’t extraordinary. However, we would definitely visit again to try more dishes from Nusa Dua’s menu, and at under £20 per person, it isn’t too expensive given the location. Halal status verified. Prayer facilities also on premises. I’ve been here! You should try their Indonesian bubble tea…it’s so good!! ? Ah! We were stuffed but I’ll keep that in mind next time, thanks!